1st one was placed slightly left from the center of the beach. You see the pine tree in the photo and it is photogenic location. 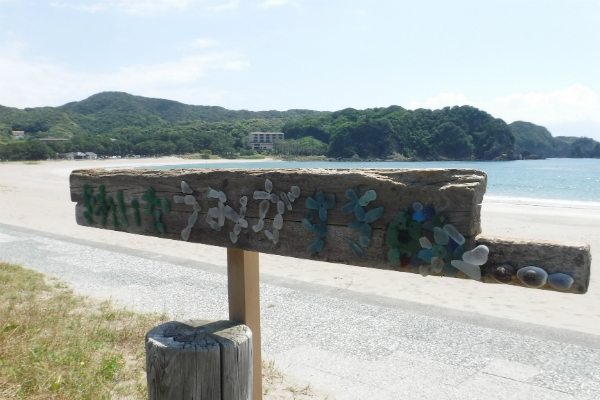 2nd one was placed in front of the parking located on the right of Yumigahama beach(Front of Kiichiyu inn). Many people use this parking and here is naturally noticeable by the visitors. After consulted with the chief officer of Minato-ku, the action was quick taken and the officers gave me ‘go’ so smoothly. My wish is that these sign boards will loosen up all locals and visitors and make them feel warm and help the beach keep clean. Also, this month in June, thanks to Chiko-chan at Beach money shop(BLUE BLUE) in Tosa Shinizu city in Kochi pref., it is planned to place them at 2 locations at the beach. 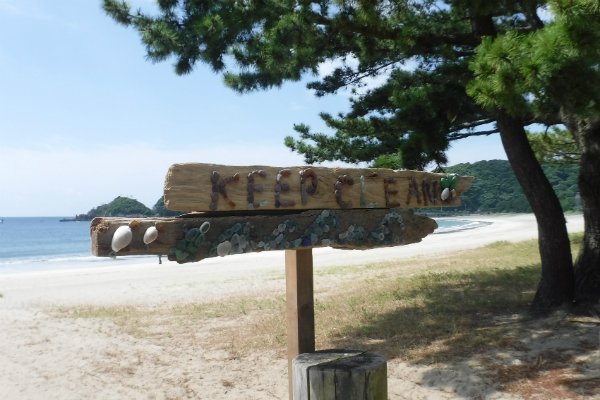 Plus, I am having my friend work on this to place the signage at the beach of Tsujido. If any of you find the beach grass missing from the board, I would be happy if you fix it with your own beach grass secretly.